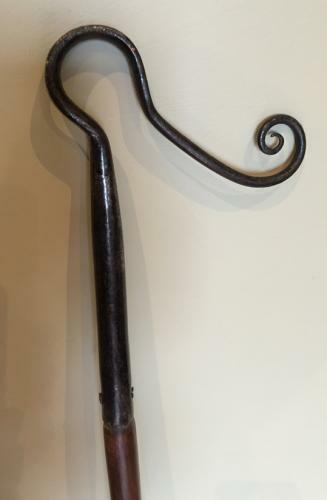 Antique Shepherd's Leg Crook. Large open swirl curling back in on itself typical of Wiltshire/Somerset region. Delicate and well balanced head. Double swirl end, narrow straight cut shank so possibly made from old gun barrel. Delicate narrow shaft with nicely widening tapering end. The Leg Crook was the everyday walking crook used by the shepherd on a daily basis and designed to catch the sheep in one swift action at the top of the leg.